After we packed our bags into our hired car, and said our goodbyes to the McCormack family we headed on our eight our track to Wellington, yes that’s right no typos here, eight hours! Our longest journey in a car ever and we were driving. At least they drive on the same side of the road as in Ireland, which made the whole trip a lot easier. I thought that New Zealand was about the same size as Ireland, well it looks small adjacent to Australia! It was only when I learned that Hamilton was an hour and half’s drive from Auckland and only a blip on the overall map did I begin to realise the true size of NZ. NZ is actually about the same size as the UK with a population of Ireland. We decided to head down on as a direct route as possible and managed to enjoy some of the fantastic scenery, only when we weren’t driving of course. Although we found the road safety signs to be equally eye catching. Unfortunately we didn’t get any photos but they included statements like “Crash at a mates” and were very effective. We will hopefully get some photos on our next road trip and post them next time. Anyway our trip was slightly complicated by the fact the “desert road” was shut and we had to take a detour that took around an extra hour. Just what you need when you are travelling for eight hours! 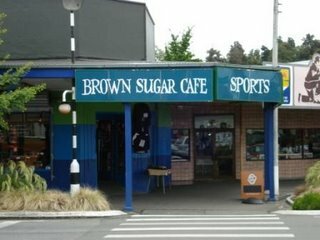 Luckily we didn’t have to detour Taihape, where there was a really nice coffee shop recommended by Anna McCormack called the “Brown Sugar Café.” Considering it was either that or a drive thru McDonalds or the like it was a welcome pit stop. 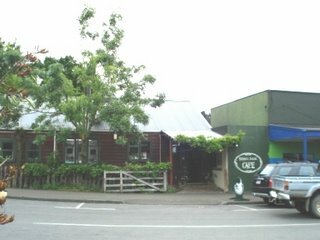 Here are some photos of Taihape a typical town you would drive through on your way down and one of the café itself. We stopped a number of times before finally arriving in Wellington. 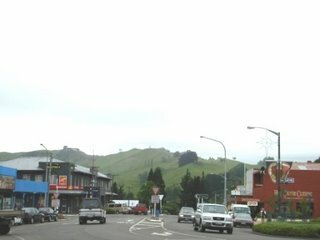 There is some fantastic scenery on the way into Wellington, at some of the holiday towns along the coast and hopefully we will get to post some of these places when we get a chance to do some real sight seeing. Anyway that’s all we have for now, will hopefully have some photos and comments on Wellington soon. I’m sure you can’t wait! ?